A main research field is the development, analysis, improvement and application of numerical methods for equations coming from CFD. These methods are based on finite element or finite volume methods as spatial discretization and implicit temporal discretizations. Convection-diffusion-reaction equations model, for instance, transport processes which are driven by diffusion or convection. A challenging situation from the point of view of simulations is the c ase of dominant convection, because the solution has scales which cannot be resolved by the used grids (layers). Standard stabilized methods lead to smeared discrete solutions or to solutions possessing spurious oscillations. Spurious oscillations are not acceptable in many applications. On research topic is the development of oscillation-free numerical methods for convection-dominated equations. In addition, numerical methods for nonlinear transport equations with exponential nonlinearities are developed and analyzed. The Navier--Stokes equations are the fundamental equations of fluid mechanics. 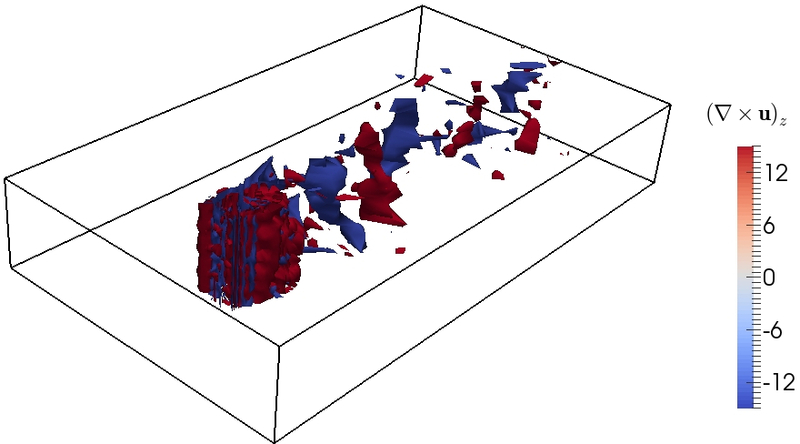 A main topic of research are methods for the simulation of turbulent flows, in particular large eddy simulation (LES) and variational multiscale (VMS) methods. The basic difficulty in the simulation of turbulent flows consists also in the impossibility of resolving small flow structures (scales) on the used grids. LES and VMS methods are two approaches for the simulation of large scales, which model the effect of the unresolved small scales onto the large scales via a turbulence model. Another topic of research is the development of discretely mass-conserving discretizations. This property is essential for some of the considered applications. In these applications, coupled systems of equations have to be solved that contain (among others) the types of equations described above. An example are population balance systems. These are coupled systems consisting of the Navier-Stokes equations (flow), convection-diffusion-reaction equations (chemical reaction, transport of energy) and transport equations for the particle size distribution. These transport equations are defined in a higher dimension than the other equations because the particle size distribution depends also on properties of the particles (internal coordinates). Another example are van Roosbroeck systems which describe the transport of carriers in a semiconductor crystal lattice. The equations of such systems contain exponential nonlinearities. Numerical methods for Stokes--Darcy systems, which model the coupling of free flows and flows in porous media, are investigated, too. In addition, it is studied to which extend reduced order models are able to increase the efficiency of simulations with only an acceptable loss of accuracy. We consider inf-sup stable mixed methods for the time-dependent incompressible Stokes and Navier--Stokes equations, extending earlier work on the steady (Navier-)Stokes Problem. A locking phenomenon is identified for classical inf-sup stable methods like the Taylor-Hood or the Crouzeix-Raviart elements by a novel, elegant and simple numerical analysis and corresponding numerical experiments, whenever the momentum balance is dominated by forces of a gradient type. More precisely, a reduction of the L2 convergence order for high order methods, and even a complete stall of the L2 convergence order for lowest-order methods on preasymptotic meshes is predicted by the analysis and practically observed. On the other hand, it is also shown that (structure-preserving) pressure-robust mixed methods do not suffer from this locking phenomenon, even if they are of lowest-order. A connection to well-balanced schemes for (vectorial) hyperbolic conservation laws like the shallow water or the compressible Euler equations is made. M. Akbas, A. Linke, L.G. Rebholz, P.W. Schroeder, The analogue of grad-div stabilization in DG methods for incompressible flows: Limiting behavior and extension to tensor-product meshes, Computer Methods in Applied Mechanics and Engineering, 341 (2018), pp. 917--938, DOI 10.20347/WIAS.PREPRINT.2448 . Grad-div stabilization is a classical remedy in conforming mixed finite element methods for incompressible flow problems, for mitigating velocity errors that are sometimes called poor mass conservation. Such errors arise due to the relaxation of the divergence constraint in classical mixed methods, and are excited whenever the spacial discretization has to deal with comparably large and complicated pressures. In this contribution, an analogue of grad-div stabilization is presented for nonconforming flow discretizations of Discontinuous Galerkin or nonconforming finite element type. Here the key is the penalization of the jumps of the normal velocities over facets of the triangulation, which controls the measure-valued part of the distributional divergence of the discrete velocity solution. Furthermore, we characterize the limit for arbitrarily large penalization parameters, which shows that the proposed nonconforming Discontinuous Galerkin methods remain robust and accurate in this limit. Several numerical examples illustrate the theory and show their relevance for the simulation of practical, nontrivial flows. G.R. Barrenechea, V. John, P. Knobloch, R. Rankin, A unified analysis of algebraic flux correction schemes for convection-diffusion equations, SeMA Journal. Boletin de la Sociedad Espannola de Matematica Aplicada, 75 (2018), pp. 655--685, DOI 10.1007/s40324-018-0160-6 . P.W. Schroeder, Ch. Lehrenfeld, A. Linke, G. Lube, Towards computable flows and robust estimates for inf-sup stable FEM applied to the time-dependent incompressible Navier--Stokes equations, SeMA Journal. Boletin de la Sociedad Espannola de Matematica Aplicada, 75 (2018), pp. 629--653, DOI 10.1007/s40324-018-0157-1 . J. DE Frutos, B. Garc'ia-Archilla, V. John, J. Novo, Analysis of the grad-div stabilization for the time-dependent Navier--Stokes equations with inf-sup stable finite elements, Advances in Computational Mathematics, 44 (2018), pp. 195--225. N. Ahmed, C. Bartsch, V. John, U. Wilbrandt, An assessment of solvers for some saddle point problems emerging from the incompressible Navier--Stokes equations, Computer Methods in Applied Mechanics and Engineering, 331 (2018), pp. 492--513, DOI 10.1016/j.cma.2017.12.004 . Efficient incompressible flow simulations, using inf-sup stable pairs of finite element spaces, require the application of efficient solvers for the arising linear saddle point problems. This paper presents an assessment of different solvers: the sparse direct solver UMFPACK, the flexible GMRES (FGMRES) method with different coupled multigrid preconditioners, and FGMRES with Least Squares Commutator (LSC) preconditioners. The assessment is performed for steady-state and time-dependent flows around cylinders in 2d and 3d. Several pairs of inf-sup stable finite element spaces with second order velocity and first order pressure are used. It turns out that for the steady-state problems often FGMRES with an appropriate multigrid preconditioner was the most efficient method on finer grids. For the time-dependent problems, FGMRES with LSC preconditioners that use an inexact iterative solution of the velocity subproblem worked best for smaller time steps. N. Ahmed, V. John, G. Matthies, J. Novo, A local projection stabilization/continuous Galerkin--Petrov method for incompressible flow problems, Applied Mathematics and Computation, 333 (2018), pp. 304--324, DOI 10.1016/j.amc.2018.03.088 . N. Ahmed, A. Linke, Ch. Merdon, On really locking-free mixed finite element methods for the transient incompressible Stokes equations, SIAM Journal on Numerical Analysis, 56 (2018), pp. 185--209. Inf-sup stable mixed methods for the steady incompressible Stokes equations that relax the divergence constraint are often claimed to deliver locking-free discretizations. However, this relaxation leads to a pressure-dependent contribution in the velocity error, which is proportional to the inverse of the viscosity, thus giving rise to a (different) locking phenomenon. However, a recently proposed modification of the right hand side alone leads to a discretization that is really locking-free, i.e., its velocity error converges with optimal order and is independent of the pressure and the smallness of the viscosity. In this contribution, we extend this approach to the transient incompressible Stokes equations, where besides the right hand side also the velocity time derivative requires an improved space discretization. Semi-discrete and fully-discrete a-priori velocity and pressure error estimates are derived, which show beautiful robustness properties. Two numerical examples illustrate the superior accuracy of pressure-robust space discretizations in the case of small viscosities. V. John, S. Kaya, J. Novo, Finite element error analysis of a mantle convection model, International Journal of Numerical Analysis and Modeling. Wuhan University, Wuhan and Institute for Scientific Computing and Information(ISCI), Edmonton, Alberta. English., 15 (2018), pp. 677--698, DOI 10.20347/WIAS.PREPRINT.2403 . A mantle convection model consisting of the stationary Stokes equations and a time-dependent convection-diffusion equation for the temperature is studied. The Stokes problem is discretized with a conforming inf-sup stable pair of finite element spaces and the temperature equation is stabilized with the SUPG method. Finite element error estimates are derived which show the dependency of the error of the solution of one problem on the error of the solution of the other equation. The dependency of the error bounds on the coefficients of the problem is monitored. V. John, P. Knobloch, J. Novo, Finite elements for scalar convection-dominated equations and incompressible flow problems -- A never ending story?, Computing and Visualization in Science, 19 (2018), pp. 47--63. The contents of this paper is twofold. First, important recent results concerning finite element methods for convection-dominated problems and incompressible flow problems are described that illustrate the activities in these topics. Second, a number of, in our opinion, important problems in these fields are discussed. A. Linke, Ch. Merdon, M. Neilan, F. Neumann, Quasi-optimality of a pressure-robust nonconforming finite element method for the Stokes problem, Mathematics of Computation, 87 (2018), pp. 1543--1566, DOI 10.1090/mcom/3344 . Nearly all classical inf-sup stable mixed finite element methods for the incompressible Stokes equations are not pressure-robust, i.e., the velocity error is dependent on the pressure. However, recent results show that pressure-robustness can be recovered by a non-standard discretization of the right hand side alone. This variational crime introduces a consistency error in the method which can be estimated in a straightforward manner provided that the exact velocity solution is sufficiently smooth. The purpose of this paper is to analyze the pressure-robust scheme with low regularity. The numerical analysis applies divergence-free H¹-conforming Stokes finite element methods as a theoretical tool. As an example, pressure-robust velocity and pressure a-priori error estimates will be presented for the (first order) nonconforming Crouzeix--Raviart element. A key feature in the analysis is the dependence of the errors on the Helmholtz projector of the right hand side data, and not on the entire data term. Numerical examples illustrate the theoretical results. We prove that in finite element settings where the divergence-free subspace of the velocity space has optimal approximation properties, the solution of Chorin/Temam projection methods for Navier-Stokes equations equipped with grad-div stabilization with parameter gamma, converge to the associated coupled method solution with rate 1/gamma as gamma goes to infinity. We prove this first for backward Euler schemes, and then extend the results to BDF2 schemes, and finally to schemes with outflow boundary conditions. Several numerical experiments are given which verify the convergence rate, and show how using projection methods in this setting with large grad-div stabilization parameters can dramatically improve accuracy. Classical inf-sup stable mixed finite elements for the incompressible (Navier--)Stokes equations are not pressure-robust, i.e., their velocity errors depend on the continuous pressure. How-ever, a modification only in the right hand side of a Stokes discretization is able to reestablish pressure-robustness, as shown recently for several inf-sup stable Stokes elements with discontinuous discrete pressures. In this contribution, this idea is extended to low and high order Taylor--Hood and mini elements, which have continuous discrete pressures. For the modification of the right hand side a velocity reconstruction operator is constructed that maps discretely divergence-free test functions to exactly divergence-free ones. The reconstruction is based on local H(div)-conforming flux equilibration on vertex patches, and fulfills certain orthogonality properties to provide consistency and optimal a-priori error estimates. Numerical examples for the incompressible Stokes and Navier--Stokes equations confirm that the new pressure-robust Taylor--Hood and mini elements converge with optimal order and outperform signi--cantly the classical versions of those elements when the continuous pressure is comparably large. Various realizations of variational multiscale (VMS) methods for simulating turbulent incompressible flows have been proposed in the past fifteen years. All of these realizations obey the basic principles of VMS methods: They are based on the variational formulation of the incompressible Navier--Stokes equations and the scale separation is defined by projections. However, apart from these common basic features, the various VMS methods look quite different. In this review, the derivation of the different VMS methods is presented in some detail and their relation among each other and also to other discretizations is discussed. Another emphasis consists in giving an overview about known results from the numerical analysis of the VMS methods. A few results are presented in detail to highlight the used mathematical tools. Furthermore, the literature presenting numerical studies with the VMS methods is surveyed and the obtained results are summarized. A finite element error analysis of a local projection stabilization (LPS) method for the time-dependent Navier--Stokes equations is presented. The focus is on the high-order term-by-term stabilization method that has one level, in the sense that it is defined on a single mesh, and in which the projection-stabilized structure of standard LPS methods is replaced by an interpolation-stabilized structure. The main contribution is on proving, theoretically and numerically, the optimal convergence order of the arising fully discrete scheme. In addition, the asymptotic energy balance is obtained for slightly smooth flows. Numerical studies support the analytical results and illustrate the potential of the method for the simulation of turbulent flows. Smooth unsteady flows are simulated with optimal order of accuracy. In this contribution, classical mixed methods for the incompressible Navier-Stokes equations that relax the divergence constraint and are discretely inf-sup stable, are reviewed. Though the relaxation of the divergence constraint was claimed to be harmless since the beginning of the 1970ies, Poisson locking is just replaced by another more subtle kind of locking phenomenon, which is sometimes called poor mass conservation. Indeed, divergence-free mixed methods and classical mixed methods behave qualitatively in a different way: divergence-free mixed methods are pressure-robust, which means that, e.g., their velocity error is independent of the continuous pressure. The lack of pressure-robustness in classical mixed methods can be traced back to a consistency error of an appropriately defined discrete Helmholtz projector. Numerical analysis and numerical examples reveal that really locking-free mixed methods must be discretely inf-sup stable and pressure-robust, simultaneously. Further, a recent discovery shows that locking-free, pressure-robust mixed methods do not have to be divergence-free. Indeed, relaxing the divergence constraint in the velocity trial functions is harmless, if the relaxation of the divergence constraint in some velocity test functions is repaired, accordingly. This paper studies the parameter choice in the grad-div stabilization applied to the generalized problems of Oseen type. Stabilization parameters based on minimizing the H1(Ω) error of the velocity are derived which do not depend on the viscosity parameter. For the proposed parameter choices, the H1(Ω) error of the velocity is derived that shows a direct dependence on the viscosity parameter. Differences and common features to the situation for the Stokes equations are discussed. Numerical studies are presented which confirm the theoretical results. Moreover, for the Navier- Stokes equations, numerical simulations were performed on a two-dimensional ow past a circular cylinder. It turns out, for the MINI element, that the best results can be obtained without grad-div stabilization. The divergence constraint of the incompressible Navier--Stokes equations is revisited in the mixed finite element framework. While many stable and convergent mixed elements have been developed throughout the past four decades, most classical methods relax the divergence constraint and only enforce the condition discretely. As a result, these methods introduce a pressure-dependent consistency error which can potentially pollute the computed velocity. These methods are not robust in the sense that a contribution from the right-hand side, which influences only the pressure in the continuous equations, impacts both velocity and pressure in the discrete equations. This paper reviews the theory and practical implications of relaxing the divergence constraint. Several approaches for improving the discrete mass balance or even for computing divergence-free solutions will be discussed: grad-div stabilization, higher order mixed methods derived on the basis of an exact de Rham complex, $bH(mathrmdiv)$-conforming finite elements, and mixed methods with an appropriate reconstruction of the test functions. Numerical examples illustrate both the potential effects of using non-robust discretizations and the improvements obtained by utilizing pressure-robust discretizations. Recently, a novel approach for the robust discretization of the incompressible Stokes equations was proposed that slightly modifies the nonconforming Crouzeix--Raviart element such that its velocity error becomes pressure-independent. The modification results in an O(h) consistency error that allows straightforward proofs for the optimal convergence of the discrete energy norm of the velocity and of the L2 norm of the pressure. However, though the optimal convergence of the velocity in the L2 norm was observed numerically, it appeared to be nontrivial to prove. In this contribution, this gap is closed. Moreover, the dependence of the error estimates on the discrete inf-sup constant is traced in detail, which shows that classical error estimates are extremely pessimistic on domains with large aspect ratios. Numerical experiments in 2D and 3D illustrate the theoretical findings. We present the error analysis of a B-spline based finite-element approximation of the stream-function formulation of the large scale wind-driven ocean circulation. In particular, we derive optimal error estimates for h-refinement using a Nitsche-type variational formulations of the two simplied linear models of the stationary quasigeostrophic equations, namely the Stommel and Stommel--Munk models. Numerical results on rectangular and embedded geometries confirm the error analysis. Standard mixed finite element methods for the incompressible Navier-Stokes equations that relax the divergence constraint are not robust against large irrotational forces in the momentum balance and the velocity error depends on the continuous pressure. This robustness issue can be completely cured by using divergence-free mixed finite elements which deliver pressure-independent velocity error estimates. However, the construction of H1-conforming, divergence-free mixed finite element methods is rather difficult. Instead, we present a novel approach for the construction of arbitrary order mixed finite element methods which deliver pressure-independent velocity errors. The approach does not change the trial functions but replaces discretely divergence-free test functions in some operators of the weak formulation by divergence-free ones. This modification is applied to inf-sup stable conforming and nonconforming mixed finite element methods of arbitrary order in two and three dimensions. Optimal estimates for the incompressible Stokes equations are proved for the H1 and L2 errors of the velocity and the L2 error of the pressure. Moreover, both velocity errors are pressure-independent, demonstrating the improved robustness. Several numerical examples illustrate the results. The pseudostress approximation of the Stokes equations rewrites the stationary Stokes equations with pure (but possibly inhomogeneous) Dirichlet boundary conditions as another (equivalent) mixed scheme based on a stress in H(div) and the velocity in $L^2$. Any standard mixed finite element function space can be utilized for this mixed formulation, e.g. the Raviart-Thomas discretization which is related to the Crouzeix-Raviart nonconforming finite element scheme in the lowest-order case. The effective and guaranteed a posteriori error control for this nonconforming velocity-oriented discretization can be generalized to the error control of some piecewise quadratic velocity approximation that is related to the discrete pseudostress. The analysis allows for local inf-sup constants which can be chosen in a global partition to improve the estimation. Numerical examples provide strong evidence for an effective and guaranteed error control with very small overestimation factors even for domains with large anisotropy. We devise and analyze arbitrary-order nonconforming methods for the discretization of the viscosity-dependent Stokes equations on simplicial meshes. We keep track explicitly of the viscosity and aim at pressure-robust schemes that can deal with the practically relevant case of body forces with large curl-free part in a way that the discrete velocity error is not spoiled by large pressures. The method is inspired from the recent Hybrid High-Order (HHO) methods for linear elasticity. After elimination of the auxiliary variables by static condensation, the linear system to be solved involves only discrete face-based velocities, which are polynomials of degree k >=0, and cell-wise constant pressures. Our main result is a pressure-independent energy-error estimate on the velocity of order (k+1). The main ingredient to achieve pressure-independence is the use of a divergence-preserving velocity reconstruction operator in the discretization of the body forces. We also prove an L2-pressure estimate of order (k+1) and an L2-velocity estimate of order (k+2), the latter under elliptic regularity. The local mass and momentum conservation properties of the discretization are also established. Finally, two- and three-dimensional numerical results are presented to support the analysis. The approximation of the time-dependent Oseen problem using inf-sup stable mixed finite elements in a Galerkin method with grad-div stabilization is studied. The main goal is to prove that adding a grad-div stabilization term to the Galerkin approximation has a stabilizing effect for small viscosity. Both the continuous-in-time and the fully discrete case (backward Euler method, the two-step BDF, and Crank--Nicolson schemes) are analyzed. In fact, error bounds are obtained that do not depend on the inverse of the viscosity in the case where the solution is sufficiently smooth. The bounds for the divergence of the velocity as well as for the pressure are optimal. The analysis is based on the use of a specific Stokes projection. Numerical studies support the analytical results. Weighted essentially non-oscillatory (WENO) finite difference schemes have been recommended in a competitive study of discretizations for scalar evolutionary convection-diffusion equations . This paper explores the applicability of these schemes for the simulation of incompressible flows. To this end, WENO schemes are used in several non-incremental and incremental projection methods for the incompressible Navier-Stokes equations. Velocity and pressure are discretized on the same grid. A pressure stabilization Petrov-Galerkin (PSPG) type of stabilization is introduced in the incremental schemes to account for the violation of the discrete inf-sup condition. Algorithmic aspects of the proposed schemes are discussed. The schemes are studied on several examples with different features. It is shown that the WENO finite difference idea can be transferred to the simulation of incompressible flows. Some shortcomings of the methods, which are due to the splitting in projection schemes, become also obvious. Finite element error estimates are derived for the incompressible Stokes equations with variable viscosity. The ratio of the supremum and the infimum of the viscosity appears in the error bounds. Numerical studies show that this ratio can be observed sometimes. However, often the numerical results show a weaker dependency on the viscosity. This contribution studies the influence of the pressure on the velocity error in finite element discretisations of the Navier--Stokes equations. Three simple benchmark problems that are all close to real-world applications convey that the pressure can be comparably large and is not to be underestimated. For widely used finite element methods like the Taylor--Hood finite element method, such relatively large pressures can lead to spurious oscillations and arbitrarily large errors in the velocity, even if the exact velocity is in the ansatz space. Only mixed finite element methods, whose velocity error is pressure-independent, like the Scott--Vogelius finite element method can avoid this influence. Algebraic flux correction schemes are nonlinear discretizations of convection dominated problems. In this work, a scheme from this class is studied for a steady-state convection--diffusion equation in one dimension. It is proved that this scheme satisfies the discrete maximum principle. Also, as it is a nonlinear scheme, the solvability of the linear subproblems arising in a Picard iteration is studied, where positive and negative results are proved. Furthermore, the non-existence of solutions for the nonlinear scheme is proved by means of counterexamples. Therefore, a modification of the method, which ensures the existence of a solution, is proposed. A weak version of the discrete maximum principle is proved for this modified method. Nearly all inf-sup stable mixed finite elements for the incompressible Stokes equations relax the divergence constraint. The price to pay is that a priori estimates for the velocity error become pressure-dependent, while divergence-free mixed finite elements deliver pressure-independent estimates. A recently introduced new variational crime using lowest-order Raviart-Thomas velocity reconstructions delivers a much more robust modified Crouzeix-Raviart element, obeying an optimal pressure-independent discrete H1 velocity estimate. Refining this approach, a more sophisticated variational crime employing the lowest-order BDM element is proposed, which also allows proving an optimal pressure independent L2 velocity error. Numerical examples confirm the analysis and demonstrate the improved robustness in the Navier-Stokes case. Optimal error estimates for the pressure stabilized Petrov--Galerkin (PSPG) method for the continuous-in-time discretization of the evolutionary Stokes equations are proved in the case of regular solutions. The main result is applicable to higher order finite elements. The error bounds for the pressure depend on the error of the pressure at the initial time. An approach is suggested for choosing the discrete initial velocity in such a way that this error is bounded. The “instability of the discrete pressure for small time steps”, which is reported in the literature, is discussed on the basis of the analytical results. Numerical studies confirm the theoretical results, showing in particular that this instability does not occur for the proposed initial condition. This paper presents a Streamline-Upwind Petrov--Galerkin (SUPG) reduced order model (ROM) based on Proper Orthogonal Decomposition (POD). This ROM is investigated theoretically and numerically for convection-dominated convection-diffusion-reaction equations. The SUPG finite element method was used on realistic meshes for computing the snapshots, leading to some noise in the POD data. Numerical analysis is used to propose the scaling of the stabilization parameter for the SUPG-ROM. Two approaches are used: One based on the underlying finite element discretization and the other one based on the POD truncation. The resulting SUPG-ROMs and the standard Galerkin ROM (G-ROM) are studied numerically. For many settings, the results obtained with the SUPG-ROMs are more accurate. Finally, one of the choices for the stabilization parameter is recommended. This paper provides guaranteed upper energy error bounds for a modified lowest-order nonconforming Crouzeix--Raviart finite element method for the Stokes equations. The modification from [A. Linke 2014, On the role of the Helmholtz-decomposition in mixed methods for incompressible flows and a new variational crime] is based on the observation that only the divergence-free part of the right-hand side should balance the vector Laplacian. The new method has optimal energy error estimates and can lead to errors that are smaller by several magnitudes, since the estimates are pressure-independent. An efficient a posteriori velocity error estimator for the modified method also should involve only the divergence-free part of the right-hand side. Some designs to approximate the Helmholtz projector are compared and verified by numerical benchmark examples. They show that guaranteed error control for the modified method is possible and almost as sharp as for the unmodified method. A. Linke, On the role of the Helmholtz decomposition in mixed methods for incompressible flows and a new variational crime, Computer Methods in Applied Mechanics and Engineering, 268 (2014), pp. 782--800. According to the Helmholtz decomposition, the irrotational parts of the momentum balance equations of the incompressible Navier-Stokes equations are balanced by the pressure gradient. Unfortunately, nearly all mixed methods for incompressible flows violate this fundamental property, resulting in the well-known numerical instability of poor mass conservation. The origin of this problem is the lack of L2-orthogonality between discretely divergence-free velocities and irrotational vector fields. In order to cure this, a new variational crime using divergence-free velocity reconstructions is proposed. Applying lowest order Raviart-Thomas velocity reconstructions to the nonconforming Crouzeix-Raviart element allows to construct a cheap flow discretization for general 2d and 3d simplex meshes that possesses the same advantageous robustness properties like divergence-free flow solvers. In the Stokes case, optimal a-priori error estimates for the velocity gradients and the pressure are derived. Moreover, the discrete velocity is independent of the continuous pressure. Several detailed linear and nonlinear numerical examples illustrate the theoretical findings. E. Jenkins, V. John, A. Linke, L.G. Rebholz, On the parameter choice in grad-div stabilization for the Stokes equations, Advances in Computational Mathematics, 40 (2014), pp. 491--516. Grad-div stabilization has been proved to be a very useful tool in discretizations of incompressible flow problems. Standard error analysis for inf-sup stable conforming pairs of finite element spaces predicts that the stabilization parameter should be optimally chosen to be O(1). This paper revisits this choice for the Stokes equations on the basis of minimizing the $H^1$ error of the velocity and the $L^2$ error of the pressure. It turns out, by applying a refined error analysis, that the optimal parameter choice is more subtle than known so far in the literature. It depends on the used norm, the solution, the family of finite element spaces, and the type of mesh. Depending on the situation, the optimal stabilization parameter might range from being very small to very large. The analytic results are supported by numerical examples. R. Eymard, J. Fuhrmann, A. Linke, On MAC schemes on triangular Delaunay meshes, their convergence and application to coupled flow problems, Numerical Methods for Partial Differential Equations. An International Journal, 30 (2014), pp. 1397--1424. We study two classical generalized MAC schemes on unstructured triangular Delaunay meshes for the incompressible Stokes and Navier-Stokes equations and prove their convergence for the first time. These generalizations use the duality between Voronoi and triangles of Delaunay meshes, in order to construct two staggered discretization schemes. Both schemes are especially interesting, since compatible finite volume discretizations for coupled convection-diffusion equations can be constructed which preserve discrete maximum principles. In the first scheme, called tangential velocity scheme, the pressures are defined at the vertices of the mesh, and the discrete velocities are tangential to the edges of the triangles. In the second scheme, called normal velocity scheme, the pressures are defined in the triangles, and the discrete velocities are normal to the edges of the triangles. For both schemes, we prove the convergence in $L^2$ for the velocities and the discrete rotations of the velocities for the Stokes and the Navier-Stokes problem. Further, for the normal velocity scheme, we also prove the strong convergence of the pressure in $L^2$. Linear and nonlinear numerical examples illustrate the theoretical predictions. J. DE Frutos, B. Garc'ia-Archilla, V. John, J. Novo, An adaptive SUPG method for evolutionary convection-diffusion equations, Computer Methods in Applied Mechanics and Engineering, 273 (2014), pp. 219--237. An adaptive algorithm for the numerical simulation of time-dependent convection-diffusion-reaction equations will be proposed and studied. The algorithm allows the use of the natural extension of any error estimator for the steady-state problem for controlling local refinement and coarsening. The main idea consists in considering the SUPG solution of the evolutionary problem as the SUPG solution of a particular steady-state convection-diffusion problem with data depending on the computed solution. The application of the error estimator is based on a heuristic argument by considering a certain term to be of higher order. This argument is supported in the one-dimensional case by numerical analysis. In the numerical studies, particularly the residual-based error estimator from  will be applied, which has proved to be robust in the SUPG norm. The effectivity of this error estimator will be studied and the numerical results (accuracy of the solution, fineness of the meshes) will be compared with results obtained by utilizing the adaptive algorithm proposed in . A. Caiazzo, T. Iliescu, V. John, S. Schyschlowa, A numerical investigation of velocity-pressure reduced order models for incompressible flows, Journal of Computational Physics, 259 (2014), pp. 598--616. This report has two main goals. First, it numerically investigates three velocity-pressure reduced order models (ROMs) for incompressible flows. The proper orthogonal decomposition (POD) is used to generate the modes. One method computes the ROM pressure solely based on the velocity POD modes, whereas the other two ROMs use pressure modes as well. To the best of the authors' knowledge, one of the latter methods is novel. The second goal is to numerically investigate the impact of the snapshot accuracy on the ROMs accuracy. Numerical studies are performed on a two-dimensional laminar flow past a circular obstacle. It turns out that, both in terms of accuracy and efficiency, the two ROMs that utilize pressure modes are clearly superior to the ROM that uses only velocity modes. The numerical results also show a strong correlation of the accuracy of the snap shots with the accuracy of the ROMs. A. Caiazzo, V. John, U. Wilbrandt, On classical iterative subdomain methods for the Stokes--Darcy problem, Computer & Geosciences, 18 (2014), pp. 711--728. Iterative subdomain methods for the Stokes--Darcy problem that use Robin boundary conditions on the interface are reviewed. Their common underlying structure and their main differences are identified. In particular, it is clarified that there are different updating strategies for the interface conditions. For small values of fluid viscosity and hydraulic permeability, which are relevant in applications from geosciences, it is shown in numerical studies that only one of these updating strategies leads to an efficient numerical method, if this strategy is used in combination with appropriate parameters in the Robin boundary conditions. In particular, it is observed that the values of appropriate parameters are larger than those proposed so far. Not only the size but also the ratio of appropriate Robin parameters depends on the coefficients of the problem. V. John, L. Schumacher, A study of isogeometric analysis for scalar convection-diffusion equations, Applied Mathematics Letters, 27 (2014), pp. 43--48. A general class of nonconforming meshes has been recently studied for stationary anisotropic heterogeneous diffusion problems by R. Eymard and coworkers. Thanks to these basic ideas developed for stationary problems, we derive a new discretization scheme in order to approximate the nonstationary heat problem. The unknowns of this scheme are the values at the centre of the control volumes, at some internal interfaces, and at the mesh points of the time discretization. Although the numerical scheme stems from the finite volume method, its formulation is based on the discrete version for the weak formulation defined for the heat problem. We derive error estimates for the solution in discrete norm, and an error estimate for an approximation of the gradient, in a general framework in which the discrete bilinear form is satisfying ellipticity. We prove in particular, that, when the discrete flux is calculated using a stabilized discrete gradient, the convergence order is h+k , where h (resp. k) is the mesh size of the spatial (resp. time) discretization. This estimate is valid under the regularity assumption that the exact solution is twice continuously differentiable in time and space. These error estimates are useful because they allow us to get error estimates for the approximations of the exact solution and its first derivatives. Recent research has shown that in some practically relevant situations like multiphysics flows (Galvin et al., Comput Methods Appl Mech Eng, 2012) divergence-free mixed finite elements may have a significantly smaller discretization error than standard nondivergence-free mixed finite elements. To judge the overall performance of divergence-free mixed finite elements, we investigate linear solvers for the saddle point linear systems arising in Scott-Vogelius finite element implementations of the incompressible Navier-Stokes equations. We investigate both direct and iterative solver methods. Due to discontinuous pressure elements in the case of Scott-Vogelius (SV) elements, considerably more solver strategies seem to deliver promising results than in the case of standard mixed finite elements such as Taylor-Hood elements. For direct methods, we extend recent preliminary work using sparse banded solvers on the penalty method formulation to finer meshes and discuss extensions. For iterative methods, we test augmented Lagrangian and H -LU preconditioners with GMRES, on both full and statically condensed systems. Several numerical experiments are provided that show these classes of solvers are well suited for use with SV elements and could deliver an interesting overall performance in several applications. A robust residual-based a posteriori estimator is proposed for the SUPG finite element method applied to stationary convection-diffusion-reaction equations. The error in the natural SUPG norm is estimated. The main concern of this paper is the consideration of the convection-dominated regime. A global upper bound and a local lower bound for the error are derived, where the global upper estimate relies on some hypotheses. Numerical studies demonstrate the robustness of the estimator and the fulfillment of the hypotheses. A comparison to other residual-based estimators with respect to the adaptive grid refinement is also provided. We introduce a new operator for stabilizing error that arises from the weak enforcement of mass conservation in finite element simulations of incompressible flow problems. We show this new operator has a similar positive effect on velocity error as the well-known and very successful grad-div stabilization operator, but the new operator is more attractive from an implementation standpoint because it yields a sparser block structure matrix. That is, while grad-div produces fully coupled block matrices (i.e. block-full), the matrices arising from the new operator are block-upper triangular in two dimensions, and in three dimensions the 2,1 and 3,1 blocks are empty. Moreover, the diagonal blocks of the new operator's matrices are identical to those of grad-div. We provide error estimates and numerical examples for finite element simulations with the new operator, which reveals the significant improvement in accuracy it can provide. Solutions found using the new operator are also compared to those using usual grad-div stabilization, and in all cases, solutions are found to be very similar. R. Bordás, V. John, E. Schmeyer, D. Thévenin, Measurement and simulation of a droplet population in a turbulent flow field, Computers and Fluids. Pergamon Press, Oxford., 66 (2012), pp. 52--62. The interaction of a disperse droplet population (spray) in a turbulent flow field is studied by combining wind tunnel experiments with simulations based on the model of a population balance system. The behavior of the droplets is modeled numerically by a population balance equation. Velocities of the air and of the droplets are determined by non-intrusive measurements. A direct discretization of the 4D equation for the droplet size distribution is used in the simulations. Important components of the numerical algorithm are a variational multiscale method for turbulence modeling, an upwind scheme for the 4D equation and a pre-processing approach to evaluate the aggretation integrals. The simulations of this system accurately predict the modifications of the droplet size distribution from the inlet to the outlet of the measurement section. Since the employed configuration is simple and considering that all measurement data are freely available thanks to an Internet-based repository, the considered experiment is proposed as a benchmark problem for the simulation of disperse two-phase turbulent flows. R. Eymard, Th. Gallouët, R. Herbin, A. Linke, Finite volume schemes for the biharmonic problem on general meshes, Mathematics of Computation, 81 (2012), pp. 2019--2048. We propose a finite volume scheme for the approximation of a biharmonic problem with Dirichlet boundary conditions. We prove that the piece-wise constant approximate solution converges to the exact solution, as well as the discrete approximate of the gradient and the discrete approximate of the Laplacian of the exact solution. These results are confirmed by numerical results. K. Galvin, A. Linke, L. Rebholz, N. Wilson, Stabilizing poor mass conservation in incompressible flow problems with large irrotational forcing and application to thermal convection, Computer Methods in Applied Mechanics and Engineering, 237--240 (2012), pp. 166--176. We consider the problem of poor mass conservation in mixed finite element algorithms for flow problems with large rotation-free forcing in the momentum equation. We provide analysis that suggests for such problems, obtaining accurate solutions necessitates either the use of pointwise divergence-free finite elements (such as Scott-Vogelius), or heavy grad-div stabilization of weakly divergence-free elements. The theory is demonstrated in numerical experiments for a benchmark natural convection problem, where large irrotational forcing occurs with high Rayleigh numbers. W. Hackbusch, V. John, A. Khachatryan, C. Suciu, A numerical method for the simulation of an aggregation-driven population balance system, International Journal for Numerical Methods in Fluids, 69 (2012), pp. 1646--1660. A population balance system which models the synthesis of urea is studied in this paper. The equations for the flow field, the mass and the energy balances are given in a three-dimensional domain and the equation for the particle size distribution (PSD) in a four-dimensional domain. This problem is convection-dominated and aggregation-driven. Both features require the application of appropriate numerical methods. This paper presents a numerical approach for simulating the population balance system which is based on finite element schemes, a finite difference method and a modern method to evaluate convolution integrals that appear in the aggregation term. Two experiments are considered and the numerical results are compared with experimental data. Unknown parameters in the aggregation kernel have to be calibrated. For appropriately chosen parameters, good agreements are achieved of the experimental data and the numerical results computed with the proposed method. A detailed study of the computational results reveals the influence of different parts of the aggregation kernel. M. Augustin, A. Caiazzo, A. Fiebach, J. Fuhrmann, V. John, A. Linke, R. Umla, An assessment of discretizations for convection-dominated convection-diffusion equations, Computer Methods in Applied Mechanics and Engineering, 200 (2011), pp. 3395--3409. The performance of several numerical schemes for discretizing convection-dominated convection-diffusion equations will be investigated with respect to accuracy and efficiency. Accuracy is considered in measures which are of interest in applications. The study includes an exponentially fitted finite volume scheme, the Streamline-Upwind Petrov--Galerkin (SUPG) finite element method, a spurious oscillations at layers diminishing (SOLD) finite element method, a finite element method with continuous interior penalty (CIP) stabilization, a discontinuous Galerkin (DG) finite element method, and a total variation diminishing finite element method (FEMTVD). A detailed assessment of the schemes based on the Hemker example will be presented. M. Case, V. Ervin, A. Linke, L. Rebholz, N. Wilson, Stable computing with an enhanced physics based scheme for the 3D Navier--Stokes equations, International Journal of Numerical Analysis and Modeling. Wuhan University, Wuhan and Institute for Scientific Computing and Information(ISCI), Edmonton, Alberta. English., 8 (2011), pp. 118--136. We study extensions of an earlier developed energy and helicity preserving scheme for the 3D Navier-Stokes equations and apply them to a more general class of problems. The scheme is studied together with stabilizations of grad-div type in order to mitigate the effect of the Bernoulli pressure error on the velocity error. We prove stability, convergence, discuss conservation properties, and present numerical experiments that demonstrate the advantages of the scheme. M. Case, V. Ervin, A. Linke, L. Rebholz, A connection between Scott--Vogelius and grad-div stabilized Taylor--Hood FE approximations of the Navier--Stokes equations, SIAM Journal on Numerical Analysis, 49 (2011), pp. 1461--1481. This article studies two methods for obtaining excellent mass conservation in finite element computations of the Navier-Stokes equations using continuous velocity fields. Under mild restrictions, the Scott-Vogelius element pair has recently been shown to be inf-sup stable and have optimal approximation properties, while also providing pointwise mass conservation. We present herein the first numerical tests of this element pair for the time dependent Navier-Stokes equations. We also prove that, again under these mild restrictions, the limit of the grad-div stabilized Taylor-Hood solutions to the Navier-Stokes problem converges to the Scott-Vogelius solution as the stabilization parameter tends to infinity. That is, in this setting, we provide theoretical justification that choosing the parameter large does not destroy the solution. A limiting result is also proven for the general case. Numerical tests are provided which verify the theory, and show how both Scott-Vogelius and grad-div stabilized Taylor-Hood (with large stabilization parameter) elements can provide accurate results with excellent mass conservation for Navier-Stokes approximations. 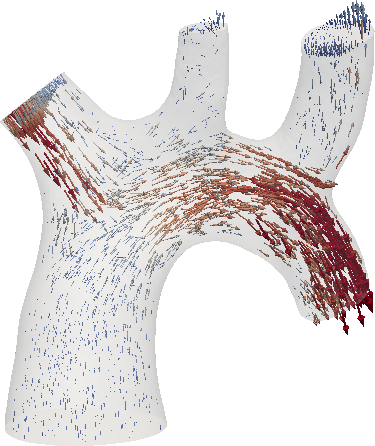 A. Caiazzo, D. Evans, J.-L. Falcone, J. Hegewald, E. Lorenz, ET AL., A complex automata approach for in-stent restenosis: Two-dimensional multiscale modeling and simulations, Journal of Computational Science, 2 (2011), pp. 9--17. J. Fuhrmann, H. Langmach, A. Linke, A numerical method for mass conservative coupling between fluid flow and solute transport, Applied Numerical Mathematics. An IMACS Journal, 61 (2011), pp. 530--553. We present a new coupled discretization approach for species transport in an incompressible fluid. The Navier-Stokes equations for the flow are discretized by the divergence-free Scott-Vogelius element on barycentrically refined meshes guaranteeing LBB stability. The convection-diffusion equation for species transport is discretized by the Voronoi finite volume method. In accordance to the continuous setting, due to the exact integration of the normal component of the flow through the Voronoi surfaces, the species concentration fulfills discrete global and local maximum principles. Besides of the the numerical scheme itself, we present important aspects of its implementation. Further, for the case of homogeneous Dirichlet boundary conditions, we give a convergence proof for the coupled scheme. We report results of the application of the scheme to the interpretation of limiting current measurements in an electrochemical flow cell with cylindrical shape. We show the velocity solutions to the convective, skew-symmetric, and rotational Galerkin finite element formulations of the Navier-Stokes equations are identical if Scott-Vogelius elements are used, and thus all three formulations will the same pointwise divergence free solution velocity. A connection is then established between the formulations for grad-div stabilized Taylor-Hood elements: under mild restrictions, the formulations' velocity solutions converge to each other (and to the Scott-Vogelius solution) as the stabilization parameter tends to infinity. Thus the benefits of using Scott-Vogelius elements can be obtained with the less expensive Taylor-Hood elements, and moreover the benefits of all the formulations can be retained if the rotational formulation is used. Numerical examples are provided that confirm the theory. S. Bartels, M. Jensen, R. Müller, Discontinuous Galerkin finite element convergence for incompressible miscible displacement problems of low regularity, SIAM Journal on Numerical Analysis, 47 (2009), pp. 3720--3743. H. Stephan, A. Khrabustovskyi, Positivity and time behavior of a linear reaction-diffusion system, non-local in space and time, Mathematical Methods in the Applied Sciences, 31 (2008), pp. 1809--1834. We consider a general linear reaction-diffusion system in three dimensions and time, containing diffusion (local interaction), jumps (nonlocal interaction) and memory effects. We prove a maximum principle, and positivity of the solution, and investigate its asymptotic behavior. Moreover, we give an explicite expression of the limit of the solution for large times. In order to obtain these results we use the following method: We construct a Riemannian manifold with complicated microstructure depending on a small parameter. We study the asymptotic behavior of the solution of a simple diffusion equation on this manifold as the small parameter tends to zero. It turns out that the homogenized system coincides with the original reaction-diffusion system what allows us to investigate its properties. CH. Brennecke, A. Linke, Ch. Merdon, J. Schöberl, Optimal and pressure-independent $L^2$ velocity error estimates for a modified Crouzeix--Raviart element with BDM reconstructions, in: Finite Volumes for Complex Applications VII -- Methods and Theoretical Aspects -- FVCA 7, Berlin, June 2014, J. Fuhrmann, M. Ohlberger, Ch. Rohde, eds., 77 of Springer Proceedings in Mathematics & Statistics, Springer International Publishing, Cham et al., 2014, pp. 159--167. Nearly all inf-sup stable mixed finite elements for the incompressible Stokes equations relax the divergence constraint. The price to pay is that a priori estimates for the velocity error become pressure-dependent, while divergence-free mixed finite elements deliver pressure-independent estimates. A recently introduced new variational crime using lowest-order Raviart-Thomas velocity reconstructions delivers a much more robust modified Crouzeix-Raviart element, obeying an optimal pressure-independent discrete H1 velocity estimate. Refining this approach, a more sophisticated variational crime employing the lowest-order BDM element is proposed, which also allows proving an optimal pressureindependent L2 velocity error. Numerical examples confirm the analysis and demonstrate the improved robustness in the Navier-Stokes case. A. Glitzky, J.A. Griepentrog, On discrete Sobolev--Poincaré inequalities for Voronoi finite volume approximations, in: Finite volumes for complex applications VI: Problems and perspectives, J. Fořt, J. Fürst, J. Halama, R. Herbin, F. Hubert, eds., Springer Proceedings in Mathematics 4, Springer, Heidelberg, 2011, pp. 533--541. S. Bartels, R. Müller, Die kalte Zunge, in: Besser als Mathe --- Moderne angewandte Mathematik aus dem MATHEON zum Mitmachen, K. Biermann, M. Grötschel, B. Lutz-Westphal, eds., Reihe: Populär, Vieweg+Teubner, Wiesbaden, 2010, pp. 227--235. M. Jensen, R. Müller, Stable Crank--Nicolson discretisation for incompressible miscible displacement problems of low regularity, in: Numerical Mathematics and Advanced Applications 2009, Part 2, G. Kreiss, P. Lötstedt, A. Målqvist, M. Neytcheva, eds., Springer, Heidelberg et al., pp. 469--477. In this article we study the numerical approximation of incompressible miscible displacement problems with a linearised Crank-Nicolson time discretisation, combined with a mixed finite element and discontinuous Galerkin method. At the heart of the analysis is the proof of convergence under low regularity requirements. Numerical experiments demonstrate that the proposed method exhibits second-order convergence for smooth and robustness for rough problems. 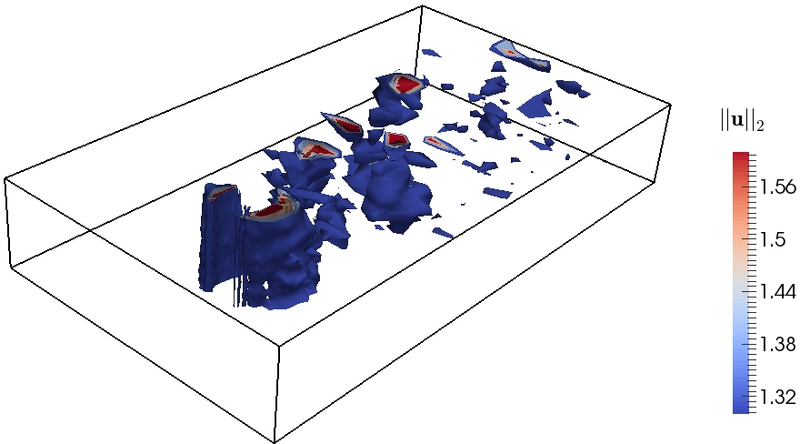 V. John, E. Schmeyer, On finite element methods for 3D time-dependent convection-diffusion-reaction equations with small diffusion, in: BAIL 2008 --- Boundary and Interior Layers, A. Hegarty, N. Kopteva, E. O'Riordan, M. Stynes, eds., 69 of Lecture Notes in Computational Science and Engineering, Springer, Berlin/Heidelberg, 2009, pp. 173--181. V. John, P. Knobloch, U. Wilbrandt, Finite element pressure stabilizations for incompressible flow problems, Preprint no. 2587, WIAS, Berlin, 2019, DOI 10.20347/WIAS.PREPRINT.2587 . Discretizations of incompressible flow problems with pairs of finite element spaces that do not satisfy a discrete inf-sup condition require a so-called pressure stabilization. This paper gives an overview and systematic assessment of stabilized methods, including the respective error analysis. P.L. Lederer, Ch. Merdon, J. Schöberl, Refined a posteriori error estimation for classical and pressure-robust Stokes finite element methods, Preprint no. 2462, WIAS, Berlin, 2017, DOI 10.20347/WIAS.PREPRINT.2462 . Recent works showed that pressure-robust modifications of mixed finite element methods for the Stokes equations outperform their standard versions in many cases. This is achieved by divergence-free reconstruction operators and results in pressure-independent velocity error estimates which are robust with respect to small viscosities. In this paper we develop a posteriori error control which reflects this robustness. A. Linke, On pressure-robustness, coherent structures and vortex-dominated flows, Leibniz MMS Days 2019, March 20 - 22, 2019, Universität Rostock , Leibniz-Institut für Atmosphärenphysik, Kühlungsborn, March 22, 2019. L. Blank, A robust finite element method for the Brinkman problem, 13th International Workshop on Variational Multiscale and Stabilized Finite Elemements, Weierstraß-Institut, Berlin, December 5, 2018. L. Blank, An unconditionally stable, low order, and robust finite element method for the numerical simulation of porous media flow, 39th Northern German Colloquium on Applied Analysis and Numerical Mathematics (NoKo 2018), June 1 - 2, 2018, Technische Universität Braunschweig, June 2, 2018. A. Caiazzo, A penalty-free Nitsche method for the Stokes, Darcy and Brinkman problems, Universität Augsburg, Lehrstuhl für Numerische Mathematik, May 15, 2018. A. Caiazzo, Mathematical modeling and simulations of geothermal reservoirs, 16th European Finite Element Fair (EFEF 2018), June 8 - 9, 2018, Universität Heidelberg,, June 8, 2018. A. Caiazzo, Multiscale and reduced-order modeling of biphasic materials with application to tissue elastography, Rheinische Friedrich-Wilhelms-Universität Bonn, Institut für Numerische Simulation, November 23, 2018. A. Caiazzo, Multiscale modeling of individual-based cancer models with arbitrary vasculature and fiber structure, ECCM-ECFD 2018, June 11 - 15, 2018, University of Glasgow, UK, June 12, 2018. V. John, Angewandte Mathematik für Strömungssimulationen, Martin-Luther-Universität Halle, Fachbereich Mathematik, October 27, 2018. V. John, Finite elements for scalar convection-dominated equations and incompressible flow problems -- A never ending story?, International Conference of Boundary and Interior Layers (BAIL 2018), June 18 - 22, 2018, University of Strathclyde, Glasgow, Scotland, UK, June 18, 2018. V. John, Variational Multiscale (VMS) methods for the simulation of turbulent incompressible flows, University of Strathclyde, Department of Mathematics and Statistics, Glasgow, UK, November 14, 2018. A. Linke, On high-order pressure-robust space discretisations, their advantages for incompressible high Reynolds number generalised Beltrami flows and beyond, 13th International Workshop on Variational Multiscale and Stabilized Finite Elemements, Weierstraß-Institut, Berlin, December 5, 2018. A. Linke, On the role of the Helmholtz--Hodge projector for a novel pressure-robust discretization theory for the incompressible Navier--Stokes equations, The University of Texas at Austin, Institute for Computational Engineering and Scienses, USA, September 18, 2018. A. Linke, On the role of the Helmholtz--Leray projector for a novel pressure-robust discretization theory for the incompressible Navier--Stokes equations, Workshop ``Finite Element Exterior Calculus (FEEC) and High Order Methods'', June 4 - 6, 2018, University of Oslo, Faculty of Mathematics and Natural Sciences, Norway, June 6, 2018. A. Linke, On the role of the Helmholtz--Leray projector for a novel pressure-robust discretization theory for the incompressible Navier--Stokes equations, Georg-August-Universität Göttingen, Institut für Numerische und Angewandte Mathematik, January 23, 2018. A. Linke, On the role of the Helmholtz--Leray projector for a novel pressure-robust discretization theory for the incompressible Navier--Stokes equations, Aix Marseille Université, Institut de Mathématiques, France, April 3, 2018. A. Linke, On the role of the Helmholtz--Leray projector for a novel pressure-robust discretization theory for the incompressible Navier--Stokes equations, Clemson University, Department of Mathematical Sciences, South Carolina, USA, August 17, 2018. A. Linke, On the role of the Helmholtz--Leray projector in the space discretization of the Navier--Stokes equations, 3rd Leibniz MMS Days 2018, February 28 - March 2, 2018, Wissenschaftszentrum Leipzig, March 1, 2018. A. Linke, Towards pressure-robust mixed methods for the incompressible Navier--Stokes equations, 89th Annual Meeting of the International Association of Applied Mathematics and Mechanics (GAMM 2018), March 19 - 23, 2018, Technische Universität München, March 22, 2018. A. Linke, User talk: Pressure-robust space discretization for the incompressible Navier--Stokes equations, 2nd NGSolve User Meeting, July 4 - 6, 2018, Georg-August-Universität Göttingen, Institut für Numerische und Angewandte Mathematik, July 5, 2018. U. Wilbrandt, Iterative subdomain methods for the Stokes--Darcy coupling, ECCM-ECFD 2018, June 11 - 15, 2018, University of Glasgow, UK, June 11, 2018. T. Keil, Simulation and control of a nonsmooth Cahn--Hilliard Navier--Stokes system with variable fluid densities (with Carmen Graessle), Annual Meeting of the DFG Priority Programme 1962, October 9 - 11, 2017, Kremmen (Sommerfeld), October 11, 2017. T. Keil, Strong stationarity conditions for the optimal control of a Cahn--Hilliard--Navier--Stokes system, 14th International Conference on Free Boundary Problems: Theory and Applications, Theme Session 8 ``Optimization and Control of Interfaces'', July 9 - 14, 2017, Shanghai Jiao Tong University, China, July 10, 2017. CH. Merdon, Druckrobuste Finite-Elemente-Methoden für die Navier-Stokes-Gleichungen, Universität Paderborn, Institut für Mathematik, April 25, 2017. CH. Merdon, Pressure-robustness in mixed finite element discretisations for the Navier--Stokes equations, Universität des Saarlandes, Fakultät für Mathematik und Informatik, July 12, 2017. N. Kumar, J.H.M. Ten Thije Boonkkamp, B. Koren, A. Linke, A nonlinear flux approximation scheme for the viscous Burgers equation, 8th International Symposium on Finite Volumes for Complex Applications (FVCA 8), Université Lille 1, Villeneuve d'Ascq, France, June 12 - 16, 2017. N. Ahmed, Higher-order discontinuous Galerkin time discretizations for the evolutionary Navier--Stokes equations, Technische Universität Dresden, Institut für Numerische Mathematik, March 9, 2017. N. Ahmed, On really locking-free mixed finite element methods for the transient incompressible Stokes equations, CASM International Conference on Applied Mathematics, May 22 - 24, 2017, Lahore University of Management Sciences, Centre for Advanced Studies in Mathematics, Pakistan, May 22, 2017. C. Bartsch, ParMooN -- A parallel finite element solver, Part I, Indian Institute of Science, Supercomputer Education and Research Centre, Bangalore, India, March 16, 2017. V. John, Analytical and numerical results for algebraic flux correction schemes, 12th International Workshop on Variational Multiscale and Stabilization Methods (VMS-2017), April 26 - 28, 2017, Edificio Celestino Mutis, Campus Reina Mercedes, Sevilla, Spain, April 26, 2017. V. John, Finite element methods for incompressible flow problems, May 14 - 18, 2017, Beijing Computational Science Research Center, Applied and Computational Mathematics, China. V. John, Finite elements for scalar convection-dominated equations and incompressible flow problems --- A never ending story?, 30th Chemnitz FEM Symposium, September 25 - 27, 2017, Bundesinstitut für Erwachsenenbildung, St. Wolfgang / Strobl, Austria, September 27, 2017. V. John, Variational multiscale (VMS) methods for the simulation of turbulent incompressible flows, CDS: Computational Science Symposium, March 16 - 18, 2017, Indian Institute of Science, Department of Computer and Data Sciences, Bangalore, India, March 16, 2017. V. John, Variational multiscale (VMS) methods for the simulation of turbulent incompressible flows, Mahindra École Centrale, School of Natural Sciences, Hyderabad, India, March 9, 2017. V. John, Variational multiscale (VMS) methods for the simulation of turbulent incompressible flows, Chinese Academy of Sciences, Academy of Mathematics and Systems Science, Beijing, May 10, 2017. V. John, Variational multiscale (VMS) methods for the simulation of turbulent incompressible flows, Peking University, School of Mathematical Sciences, Beijing, China, May 11, 2017. A. Linke, Towards pressure-robust mixed methods for the incompressible Navier--Stokes equations, 12th International Workshop on Variational Multiscale and Stabilization Methods (VMS-2017), April 26 - 28, 2017, Edificio Celestino Mutis, Campus Reina Mercedes, Sevilla, Spain, April 27, 2017. CH. Merdon, Pressure-robust finite element methods for the Navier--Stokes equations, GAMM Workshop on Numerical Analysis, November 1 - 2, 2017, Rheinisch-Westfälische Technische Hochschule Aachen, November 2, 2017. CH. Merdon, Pressure-robust mixed finite element methods for the Navier--Stokes equations, scMatheon Workshop RMMM 8 - Berlin 2017, Reliable Methods of Mathematical Modeling, July 31 - August 3, 2017, Humboldt-Universität zu Berlin, August 2, 2017. U. Wilbrandt, ParMooN -- A parallel finite element solver, Part II, Indian Institute of Science, Supercomputer Education and Research Centre, Bangalore, India, March 16, 2017. N. Ahmed, A review of VMS methods for the simulation of turbulent incompressible flows, International Conference on Differential Equations and Applications, May 26 - 28, 2016, Lahore University of Management Sciences, Pakistan, May 27, 2016. N. Ahmed, On the grad-div stabilization for the steady Oseen and Navier--Stokes evaluations, International Conference of Boundary and Interior Layers (BAIL 2016), August 15 - 19, 2016, Beijing Computational Science Research Center, Beijing, China, August 15, 2016. V. John, A review of variational multiscale methods for the simulation of turbulent incompressible flows, 15th Mathematics of Finite Elements and Applications, June 14 - 17, 2016, Brunel University London, London, UK, June 17, 2016. V. John, A review of variational multiscale methods for the simulation of turbulent incompressible flows, ``Variational Multiscale and Stabilization Methods'' (VMS2016), March 16 - 18, 2016, Otto-von-Guericke Universität Magdeburg, Magdeburg, March 17, 2016. V. John, A review of variational multiscale methods for the simulation of turbulent incompressible flows, International Conference of Boundary and Interior Layers (BAIL 2016), August 15 - 19, 2016, Beijing Computational Science Research Center, Beijing, China, August 15, 2016. V. John, A review of variational multiscale methods for the simulation of turbulent incompressible flows, 7th American Mathematical Society Meeting, Special Session on Above and Beyond Fluid Flow Studies, October 8 - 9, 2016, Denver, Colorado, USA, October 9, 2016. V. John, A survey on the analysis and numerical analysis of some turbulence models, Technische Universität Darmstadt, Fachbereich Mathematik, January 20, 2016. V. John, Ein weites Feld -- Wissenschaftliche Beiträge von Prof. Dr. Lutz Tobiska, Festkolloquium aus Anlass des 65. Geburtstags von Prof. Dr. Lutz Tobiska, Universität Magdeburg, Institut für Analysis und Numerik, March 31, 2016. V. John, On the divergence constraint in mixed finite element methods for incompressible flows, 5th European Seminar on Computing (ESCO 2016), June 5 - 10, 2016, Pilsen, Czech Republic, June 7, 2016. V. John, On the divergence constraint in mixed finite element methods for incompressible flows, Beijing Computational Science Research Center, China, August 23, 2016. V. John, The role of the pressure in finite element methods for incompressible flow problems, Summer School 2016 ``Fluids under Pressure'' and Workshop, August 29 - September 2, 2016, Nečas Center for Mathematical Modeling, Prague, Czech Republic. N. Ahmed, Adaptive time step control with variational time stepping schemes for convection-diffusion-reaction equations, 26th Biennial Numerical Analysis Conference, June 23 - 26, 2015, University of Strathclyde, Glasgow, UK, June 23, 2015. N. Ahmed, Higher order time stepping schemes, 13th European Finite Element Fair, June 5 - 6, 2015, Charles University in Prague, Praha, Czech Republic, June 5, 2015. A. Caiazzo, Assessment of Kalman filtering for parameter identification in one-dimensional blood flow model, 4th International Conference on Computational & Mathematical Biomedical Engineering, June 29 - July 1, 2015, Ecole Normale Supérieure de Cachan, Cachan, France, June 29, 2015. V. John, S. Rockel, S. Sobolev, Viscoelastic mantle flow --- Numerical modeling of geological phenomena, 4th Annual GEOSIM Workshop, Potsdam, November 17 - 18, 2015. U. Wilbrandt, Classical iterative subdomain methods for the Stokes--Darcy problem, Rheinisch-Westfälische Technische Hochschule Aachen, Institut für Geometrie und Praktische Mathematik, Aachen, June 11, 2015. A. Linke, On the role of the Helmholtz decomposition in mixed methods for incompressible flows, International Conference of Boundary and Interior Layers (BAIL 2014), September 15 - 19, 2014, Carles University Prague, Czech Republic, September 17, 2014. A. Linke, Ein neues Konstruktionsprinzip zur divergenzfreien Diskretisierung der inkompressiblen Navier-Stokes-Gleichungen, Ruhr-Universität Bochum, Fakultät für Mathematik, July 17, 2014. A. Linke, On the role of the Helmholtz decomposition in incompressible flows and a new variational crime, NonLinear PDE and Applications: Theoretical and Numerical Study, May 5 - 7, 2014, Abdelmalek Essadi University, Tanger, Morocco, May 6, 2014. A. Linke, On the role of the Helmholtz decomposition in mixed methods for incompressible flows and a new variational crime, Technische Universität Wien, Institut für Analysis und Scientific Computing, Austria, April 2, 2014. A. Linke, On the role of the Helmholtz decomposition in mixed methods for incompressible flows and a new variational crime, Technische Universität Hamburg-Harburg, Institut für Mathematik, January 7, 2014. A. Linke, On the role of the Helmholtz decomposition in mixed methods for incompressible flows and a new variational crime, Friedrich-Alexander-Universität Erlangen-Nürnberg, Fachbereich Mathematik, November 20, 2014. A. Linke, On the role of the Helmholtz decomposition in mixed methods for incompressible flows and a new variational crime, Georg-August-Universität Göttingen, Institut für Numerische und Angewandte Mathematik, December 9, 2014. V. John, On isogeometric analysis for convection-diffusion and Navier--Stokes equations, International Conference of Boundary and Interior Layers (BAIL 2014), September 15 - 19, 2014, Carles University Prague, Czech Republic, September 15, 2014. J. Fuhrmann, Voronoi finite volume methods, XVI. Mathematica-Tag, Berlin, December 9, 2014. V. John, S. Rockel, S. Sobolev, Viscoelastic mantle flow, 3rd Annual GEOSIM Workshop, Potsdam, November 13 - 14, 2014. V. John, Finite element methods for incompressible flow problems, Indian National Program on Differential Equations -- Theory, Computation, and Applications (NPDE-TCA) Advanced Workshop on Finite Element Methods for Navier--Stokes Equations, September 8 - 12, 2014, Indian Institute of Science, Numerical Mathematics & Scientific Computing, Bangalore. V. John, Numerical methods for convection-dominated equations, 2nd Workshop ``Populationsbilanzen'' of the DFG Priority Program SPP 1679 ``Dyn-Sim-FP -- Dynamic Simulation of Interconnected Solids Processes'', May 6 - 7, 2014, Technische Universität Hamburg-Harburg, May 6, 2014. V. John, On the simulation of mantle convection, Symposium on Simulation and Optimization of Extreme Fluids, November 10 - 12, 2014, Internationales Wissenschaftsforum Heidelberg, November 12, 2014. V. John, Turbulent flows and their numerical simulation, Humboldt Kolleg on Interdisciplinary Science: Catalyst for Sustainable Progress, September 4 - 6, 2014, Indian Institute of Science, Numerical Mathematics & Scientific Computing, Bangalore, September 5, 2014. U. Wilbrandt, Iterative subdomain methods for Stokes--Darcy problems, Norddeutsches Kolloquium über Angewandte Analysis und Numerische Mathematik (NoKo), May 9 - 10, 2014, Christian-Albrechts-Universität zu Kiel, May 9, 2014. V. John, On recent analytical and numerical investigations of the SUPG method, Advances in Computational Mechanics (ACM 2013) -- A Conference Celebrating the 70th Birthday of Thomas J.R. Hughes, February 24 - 27, 2013, San Diego, USA, February 27, 2013. A. Linke, Coupled flows and poor mass conservation, Workshop ``Complex grids and fluid flows, conclusion of VFSitCom, National Research Project'', April 2 - 4, 2012, Rhône-Alpes, Lyon, France, April 3, 2012. V. John, On reduced order modeling methods for incompressible flows based proper orthogonal decomposition, 6th Variational Multiscale Methods Workshop (VMS 2012), June 27 - 29, 2012, Christian-Albrechts-Universität zu Kiel, June 28, 2012. V. John, On the analysis and numerical analysis of some turbulence models, Workshop ``Connections Between Regularized and Large-Eddy Simulation Methods for Turbulence'', May 14 - 17, 2012, Banff International Research Station for Mathematical Innovation and Discovery, Canada, May 15, 2012. A. Glitzky, J.A. Griepentrog, Discrete Sobolev--Poincaré inequalities for Voronoi finite volume approximations, Finite Volumes for Complex Applications VI (FVCA 6), Prague, Czech Republic, June 6 - 10, 2011. O.C. Suciu, A numerical method for the simulation of population balance systems with one internal coordinate, 8th International Conference on Large-Scale Scientific Computations, June 6 - 10, 2011, Bulgarian Academy of Sciences, Sozopol, June 7, 2011. A. Caiazzo, J. Fuhrmann, V. John, Finite element-finite volume coupling for simulations of thin porous layer fuel cells, Workshop on Simulation of Flow in Porous Media and Applications in Waste Management and CO2 Sequestration, John Radon Institute for Computational and Applied Mathematics, Linz, Austria, October 3 - 7, 2011. A. Caiazzo, Darcy-Stokes coupling for simulation of solute transport in thin-layer channel fuel cells, Workshop on Fluid Dynamics and Porous Media, September 12 - 14, 2011, University of Coimbra, Department of Mathematics, Portugal, September 13, 2011. A. Caiazzo, Model reduction approaches for simulation of cardiovascular stents and pulmonary valve, Laboratory of Modeling and Scientific Computing, Department of Mathematics, Milan, Italy, October 27, 2011. A. Caiazzo, Physical- and mathematical-based reduced order modeling in computational hemodynamics, Wroclaw University of Technology, Institute of Mathematics and Computer Science, Poland, November 16, 2011. E. Schmeyer, V. John, R. Bordás, D. Thévenin, Referenzexperimente im Windkanal, numerische Simulation und Validierung, Annual Meeting 2010 of DFG Priority Program 1276 MetStröm, Zuse Institute Berlin, October 28 - 29, 2010. O.C. Suciu, On numerical methods for simulation of 3D/4D of population balance system, SimParTurS Meeting, Max-Planck-Institut Leipzig, February 17, 2010. V. John, A posteriori optimization of parameters in stabilized methods for convection-diffusion problems, BIRS Workshop ``Nonstandard Discretizations for Fluid Flows'', November 21 - 26, 2010, Banff International Research Station, Canada. V. John, Error analysis of the SUPG finite element discretization of evolutionary convection-diffusion-reaction equations, 6th Variational Multiscale Methods Workshop (VMS 2010), May 27 - 28, 2010, Université de Pau et des Pays de l'Adour, France, May 27, 2010. V. John, Error analysis of the SUPG finite element discretization of evolutionary convection-diffusion-reaction equations, International Conference of Boundary and Interior Layers (BAIL 2010), July 5 - 9, 2010, University of Zaragoza, Spain, July 8, 2010. V. John, On the numerical simulation of population balance systems, Technische Universität Dresden, Fakultät Mathematik und Naturwissenschaften, April 20, 2010. V. John, Variational multiscale methods for the simulation of turbulent flows, Volkswagen Wolfsburg, August 27, 2010. V. John, A variational multiscale method for turbulent flow simulation with adaptive large scale space, Workshop on Computational Multiscale Modeling, November 26 - 27, 2009, University of Twente, Enschede, Netherlands, November 27, 2009. K. Hoke, Numerical treatment of the Kohn--Sham system for semiconductor devices, Workshop on Mathematical Aspects of Transport in Mesoscopic Systems, Dublin, Ireland, December 4 - 7, 2008. H. Gajewski, R. Hünlich, H.-Chr. Kaiser, M. Baro, Quantum mechanical and macroscopic models for optoelectronic devices, DFG Research Center sc Matheon, Technische Universität Berlin, July 19, 2004. Recently, high-order space discretisations were proposed for the numerical simulation of the incompressible Navier--Stokes equations at high Reynolds numbers, even for complicated domains from simulation practice. Although the overall spatial approximation order of the algorithms depends on the approximation quality of the boundary (often not better than third order), competitively accurate and efficient results were reported. In this contribution, first, a possible explanation for this somewhat surprising result is proposed: the velocity error of high-order space discretisations is more robust against quantitatively large and complicated pressure fields than low-order methods. Second, it is demonstrated that novel pressure-robust methods are significantly more accurate than comparable classical, non-pressure-robust space discretisations, whenever the quadratic, nonlinear convection term is a nontrivial gradient field like in certain generalised Beltrami flows at high Reynolds number. Then, pressure-robust methods even allow to halve the (formal) approximation order without compromising the accuracy. Third, classical high-order space discretisations are outperformed by pressure-robust methods whenever the boundary is not approximated with high-order accuracy. This improved accuracy of (low-order) pressure-robust mixed methods is explained in terms of a Helmholtz--Hodge projector, which cancels out the nonlinear convection term in any generalised Beltrami flow, since it is a gradient field. The numerical results are illustrated by a novel numerical analysis for pressure-robust and classical space discretisations. Further, the relevance of these results is discussed for flows that are not of Beltrami type.